Kavan Joel Smith (born May 6, 1970) is a Canadian actor known for playing Major Evan Lorne in Stargate Atlantis and Stargate SG-1, as Agent Jed Garrity in The 4400, and as Leland Coulter in When Calls the Heart. Born in Edmonton, Alberta, Smith was raised by his father after his parents divorced. He attended the University of Calgary for a year and a half and then enrolled in the performing arts program at Mount Royal University. He began his acting career with a leading role in Destiny Ridge in 1993. In Stargate: Atlantis, Smith appeared in 29 episodes as the recurring character Major Evan Lorne. He also appeared in two episodes of Stargate SG-1 (the episodes "Enemy Mine" in Season 7 and "The Road Not Taken" in Season 10) as Major Lorne. He has also guest-starred in numerous television shows including Supernatural, Smallville, Sanctuary, Tru Calling, Battlestar Galactica, Outer Limits, Human Target, and The Twilight Zone. He had a recurring role as Deputy Andy on Syfy's Eureka. Smith co-stars with Felicia Day in the SyFy film adaptation Red: Werewolf Hunter, which tells the modern dark story of Red Riding Hood. Also had starring role in SyFy movie Metal Shifters in 2010. 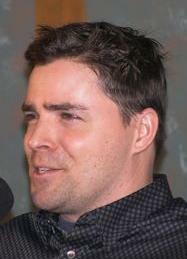 In addition to acting, Kavan has also narrated the Canadian-made documentaries Combat School and Jetstream. 1996 The Sentinel Quinn "True Crime"
1996 The Outer Limits Harrison Taylor "Straight and Narrow"
1998 The Outer Limits Lt. O'Neill "Criminal Nature"
1998 First Wave Tommy Cranston "Marker 262"
1999 The Crow: Stairway to Heaven Frank Moran "Disclosure"
1999 Dead Man's Gun Mr. Smith "A Just Reward"
2000 Hope Island Peter Gibson "Never Burn Your Tongue on the Admiral's Broth"
2000 The Outer Limits Dominic Langton "Stasis"
2001 The Outer Limits Allan "Flower Child"
2001 Big Sound Devin "The Power of Rock and Roll"
2001 Night Visions Dante "Reunion"
2002 Smallville Wade Mahoney "Kinetic"
2003 The Twilight Zone Matthew Forsenth "Developing"
2003 Jeremiah Vincent "Deus Ex Machina"
2003 Stargate SG-1 Major Evan Lorne "Enemy Mine"
2005 Killer Instinct Jonas Mentzel "13 Going on 30"
2005 Reunion Dr. David King "1993"
2006 Battlestar Galactica Lt. Richard 'Buster' Baier "The Captain's Hand"
2006 Blade: The Series Alex "Turn of the Screw"
2007 Stargate SG-1 Major Evan Lorne "The Road Not Taken"
2008 Sanctuary Det. Joe Kavanaugh "Sanctuary for All: Part 1", "Edward"
2009 The Guard Joe "Love Sick"
2010 Human Target Nathan "Victoria"
2010 Shattered Gordon Banner "Don't Wanna Die"
2012 Fairly Legal Jesse "Start Me Up"
2013 Almost Human A.D.A. Ortega "Blood Brothers"
2014-15 Supernatural Cuthbert Sinclair "Blade Runners", "The Werther Project"
2015 Motive Keith Carson "Calling the Shots"
2016 Dirk Gently's Holistic Detective Agency Nathan "Horizons", "Lost & Found"
^ "Kavan Smith as Nick on Wedding Bells". Hallmark Channel. Retrieved May 14, 2018. ^ Gentile, Petrina (May 13, 2013). "Actor's '67 Mustang didn't impress the girl". The Globe and Mail. Retrieved May 14, 2018.